how do I pre-apply filters? GIMP Forums / GIMP / General / how do I pre-apply filters? I am using gimp 2 to make a cartoon/rotoscope video. I used a separate program to remove each individual frame (2400+ frames) from a video as still images that can then be edited in Gimp. What I do is open the image, add two filters, then I save the image. The problem is repeating this over and over for each frame is getting to be very cumbersome and annoying. Is there a way to have the filter apply themselves automatically each time I open a new image? It would make things a lot easier and it would make the process go by much faster. It's annoying having to choose the filters from the drop down list every single time, especially when i keep applying the same 2 filters with the same exact settings every time. The same goes for the size of the image. Is it possible to just set gimp to a certain size and have it open at that same size every single time? It keeps asking me what size I want every time I open a new file. Gimp does remember the last size I typed in, but it still asks me to confirm it every single time i click new. RE: how do I pre-apply filters? I have no idea how to do any scripting (the whole scripting thing is confusing to me). I did try some batch plug ins though , but unfortunately they don't work for what I need. They only do basic things such as crop or re -size. What I need is a batch plug-in/feature that will allow me to apply any of the gimp filters (for this particular project I'm using cartoon and photocopy) onto all the images all at once, bypassing the need for me to spend hours adding these filters individually to each frame. Ok, the frames that I'm working on are 640 x 480 (VGA resolution). I have about 2,430 frames (in jpg) that need the following two filters: Cartoon and Photocopy (both should be under artistic in the filters menu). Now, when I create the batch, I would like for all the newly filtered images/frames to stay individual. For example, after everything is done I want each image to be save-able individually and Not as one large file that contains all the images as one. How to apply filters to multiple images? I Would like to make three questions. Im trying to execute the "Processing several files" section at the moment. (GIMP-bin:38812): Gtk-WARNING **: Locale not supported by C library. (script-fu:38832): Gtk-WARNING **: Locale not supported by C library. (script-fu:38873): Gtk-WARNING **: Locale not supported by C library. 4) Saving the script inside: "Aplications/GIMP.app/Contents/Resources/share/gimp/2.0/scripts" As "test.scm" by using the save function inside the Gimp's console. II) Im sorry but I don't know how to interpret where the images are being saved by reading those scripts. 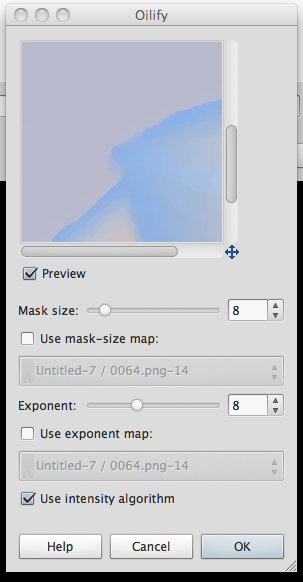 Is it mandatory to "open the image as layers"? If not how to specify the location? III) How can I fix those dumb gigantic quotes to keep the alignment of this post fine? EDIT: Fixed: press enter to break big lines. Thank you so much ofnuts for your quick reply! I will try again with your instructions. I hope to post the result pretty son. Already wrote to the Admin for more informations on how should I fix the alignment issue, i hope to fix this son too. EDIT: Fixed: just use enter to break long lines. It opens the Gimp and tell it to use the unsharp mask filter for all the files specified at the ". *png" field, replace them and then quit the GIMP. If so, this is just what i need! 1) Should I use the operational system terminal to use this command or the GIMP's console? (Just checking). So what is the correct command structure to make the magic happen? 3) I would like to apply the same principle for the "Oilify" filter inside the "Artistic" submenu, but I don't know where the corresponding .scm file is located, and how to set the parameters using the command line for the Oilify filter. Thank you very much for you time again! This function performs the well-known oil-paint effect on the specified drawable. Author: Torsten Martinsen, Daniel Richard G.
Copyright: Torsten Matinsen, Daniel Richard G.
And there is nothing in the system Terminal. But the images didn't get affected by the oilily script. Maybe there is something wrong with this .scm sample or Im using the wrong directory to put the scm script? Help! Nothing inside the terminal and the console keep returning "()"
So probably intensity "(1)" stands for true since the default value is intensity algorithm set "on". Mask size… According to the documentation "INT32". Something related to 32 bits maybe? Why the default is 32? I can't handle what "mode" stands for, there is no such option inside the tool options (screenshot). Im sorry but now, you are wrong. I did it after all! And I found the right answer because of the keywords you gently shared with everyone. I moved my folder filled with .png pictures to the "/" directory. Edit: Lol I posted the reply while paynekj was writing his post too! Thank you paynekj! Many thanks to Yorik Van Havre too for testing this procedure in Linux, which led me to the right solution inside MacOSX.